A favorite treat for summer is cold watermelon on a hot day. So before fall arrives, maybe one more card featuring a melon is in store for some challenges. 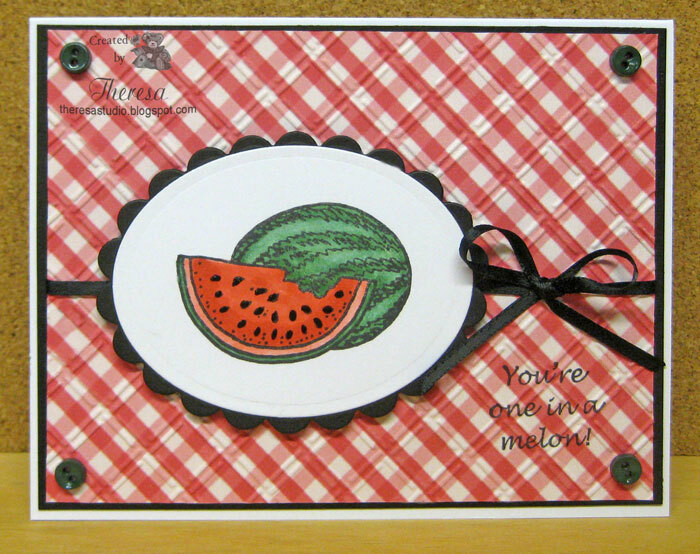 I stamped the Watermelon from Repeat Impressions Stamps with Memento Tuxedo Black ink on white cardstock and colored with Copics G21,82,85, R22,24 and used a black glaze pen on the seeds. I cut the image with Nesties oval die and layered on a black scalloped oval cut with nesties scallop oval die. For the background I used a mat of red and white check pattern paper embossed with Cuttlebug EF Wicker Weave. Card base is white cardstock with a layer of black cardstock topped with the layer of check and image. Added some black satin ribbon with bow and small green buttons to finish. Sentiment is also from Repeat Impressions. All items used were from my stash. Party Time Tuesdays: Button it up. Gorgeous card. Thank you for joining in the Crafty Sentiments challenge. Super card, great image, thanks for joining in our challenge at Fab'n'Funky. beautiful, that watermelon looks so yummy!!!! This card will certainly make you smile. Great sentiment and backing paper.